Ring of Unreliability: 30 minute accessibility difference between 90th and 50th percentile speeds. 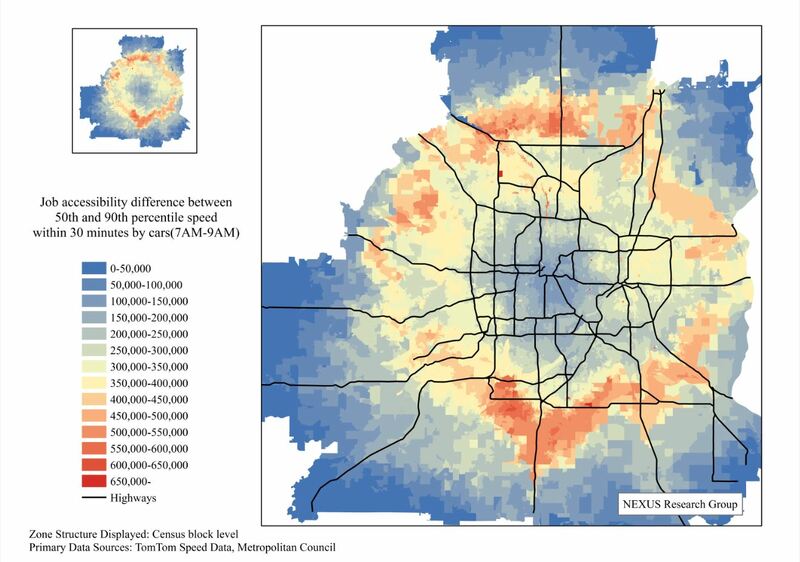 Abstract: This study measures the variability of job accessibility via automobile for the Minneapolis-St. Paul region. The accessibility analysis uses cumulative opportunity measures. The travel times on the network are tested at various level (10th percentile speed, 50th percentile speed, 90th percentile speed) using the TomTom speed data for 2010. It is shown that accessibility varies widely day-to-day as travel speeds on the network vary. Some parts of the region (a ring around the core) have more volatility in accessibility (and are thus less reliable) than others.